Pay TV customers are increasingly trading in their cable boxes for affordable streaming alternatives from OTT providers such as Netflix, Amazon and Hulu. Cord cutters (former pay TV customers) and cord nevers (those who have never signed up) remain avid video consumers. However, the rapid pace of OTT launches appears to be slowing. Rather than adding new subscriptions, consumers are more interested in aggregation alternatives, with Amazon and other larger providers likely to benefit. To win in this changing environment, providers will require a playbook for success. Like other entertainment segments in recent years, the market for pay television has been irrevocably altered by the rapid growth of lowercost, subscription-based video on demand (SVOD) services. Along the way, once reliable pay TV customers have increasingly traded in their cable boxes for streaming alternatives from over-the-top (OTT) providers such as Netflix, Hulu and Amazon Prime Video. Also vying for viewers’ attention are value-based “skinny bundles” offered by virtual multichannel video programming distributors (vMVPDs), among them Dish’s Sling TV and Sony’s cloud-based PlayStation Vue. As noted in L.E.K. Consulting’s recent survey “Digital Consumer Insights: Linear TV and OTT,” the success of these digital disruptors continues to have a pronounced impact on pricing: Where pay TV leaders such as Charter Spectrum and Time Warner Cable have in the past commanded at least $75-$100 monthly for their standard tiers, consumers can now access unlimited web-based content for as little as $10 per month, or less in some instances. As these affordable, flexible plans continue to gain market share, the increased competition will require participants to adopt new strategies that can help them compete in the rapidly evolving subscription space. In the U.S., the number of cord cutters (former pay TV customers) and cord nevers (those who have never signed up) continues to grow. As noted by media research firm SNL Kagan, more than 3 million consumers shelved their pay TV service during 2017, a threefold increase in the past two years alone. According to proprietary L.E.K. 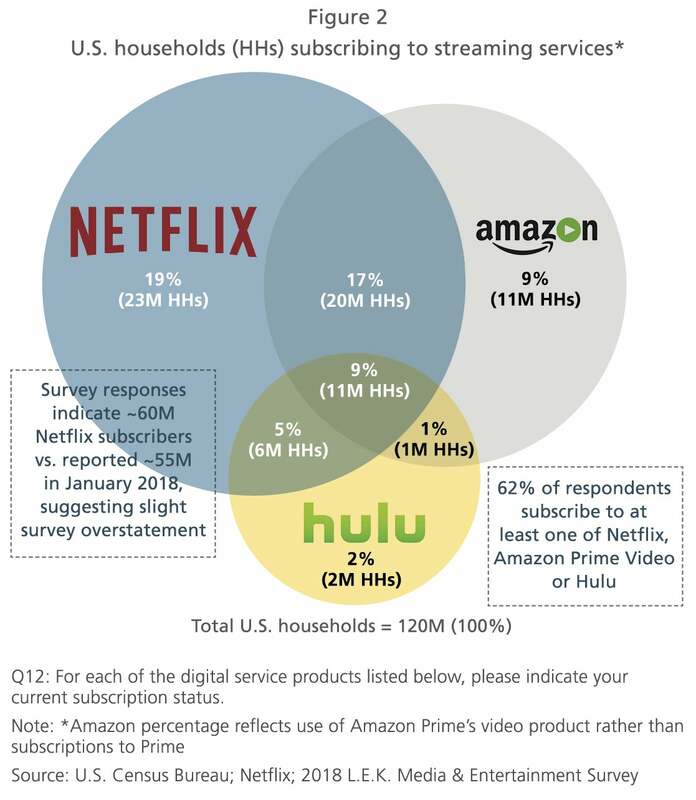 research, cost is typically the primary motivator (not surprisingly, only 10% of former pay TV users would consider resubscribing in the future). Data from Nielsen indicates that cable subscribership has already dipped below 80% of households, its lowest point since the early 2000s. 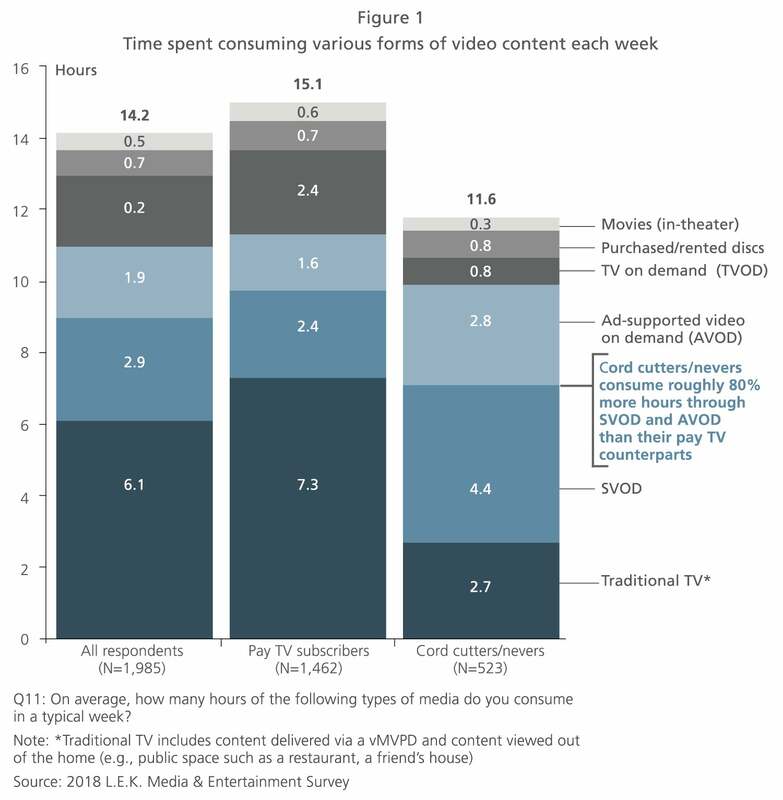 Those who’ve quit cable aren’t necessarily watching less video, either. While some cord cutters have been content with free over-the-air TV, others have been quick to jump on the streaming bandwagon: According to L.E.K., 70% maintain at least one OTT/vMVPD subscription and watch upward of 80% more programming on these services than their pay TV counterparts do (see Figure 1). The ramp-up in OTT demand is such that by 2020, “big three” providers Netflix, Amazon Prime Video and Hulu are expected to attract 200 million U.S. subscriptions combined. Indeed, the affordability of OTT has allowed consumers to enroll in several monthly packages simultaneously, boosting their viewing options in the process. Respondents with more than one OTT service tend to be younger (according to L.E.K., millennials alone carry upward of six different entertainment subscriptions) and also have higher incomes. Meanwhile, one-off platforms that consolidate activity around multiple OTT subscriptions also continue to gain favor among consumers. Using an OTT aggregator, for instance, subscribers may access all their services through one account with a single login, payment preference, user profile, etc. According to L.E.K., eight out of 10 users viewed such services as “appealing” or “very appealing.” Younger respondents would be more likely to use a digital platform as a potential aggregator, while the majority of older viewers would prefer a traditional provider. Despite the migration toward digital viewing, there are signs that OTT has become overheated. According to our latest findings, a mere 7% of subscribers reported feeling “underserved” (compared with 82% who reported having the “right” amount of pay-as-you-go entertainment). Meanwhile, during 2017 only 10 notable OTT services made their debut, compared with 2015’s record 34 offerings. Nor do budget pricing and targeted content offer any real guarantees: Even at a low $3.99/month, NBC’s comedy streaming service Seeso was forced to suspend programming after less than two years. It is our belief that further winnowing may take place, with fortunes likely to favor content super aggregators such as Netflix, as well as others that can successfully navigate niche tastes. Like music fans who abandoned $20 CDs in favor of cheap or “freemium” streaming audio services such as Spotify and Rhapsody, today’s video-content subscribers not only expect more for less, but, as the recent OTT closures suggest, they are also loath to spring for any programming that lacks true differentiation. While older consumers have continued to support pay TV pricing, lack of uptake, particularly among younger viewers, compels all players to sharpen their game, including offering more diverse content with a focus on niche viewing habits. To succeed in this changing landscape, then, providers will need a structured framework for assessing near-term OTT supply and demand in conjunction with an array of traditional and emerging players. Such a road map would include perspectives on content,audience, pricing and promotional platforms, in addition to SVOD and AVOD business-model considerations. Editor’s note: To help players achieve their goals, L.E.K. has developed a playbook that will aid all OTT stakeholders as they consider key factors that may help them develop strategies for finding streaming success going forward.